In honor of the late great Harmon Killebrew, we thought we would look back at some of Killer's best of his cards from his 22-year career. 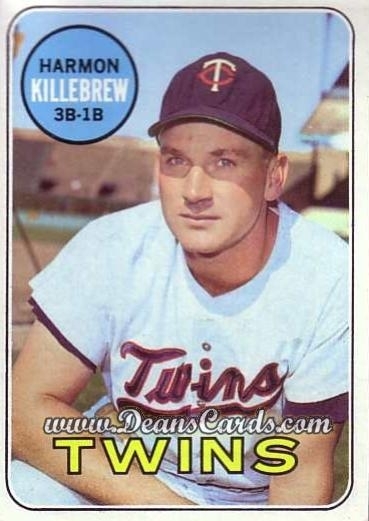 The best place to start for Killebrew's cards would have to be his rookie card (#124) in the 1955 Topps set. 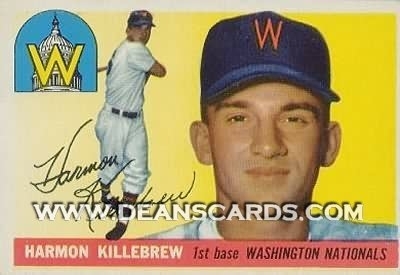 At the time this card was printed, Killebrew was playing third base for the Washington Senators. He would spend most of his career as a first baseman for the Twins franchise, which was moved from Washington D.C. to Minnesota in 1960. Killebrew played left field, center field, right field, second base, and even DH for the Royals at the end of his career. Many casual baseball fans are surprised to learn that Killebrew's career took several years to really blossom and he was not named an All-Star until 5 years after his rookie season. One of Killebrew's most attractive and expensive cards is his 1963 Topps #500 short-printed card. 1963 was another great offensive year for Killebrew. He lead the league in slugging percentage (.555) and home runs (45). Looking at the Twins' offensive statistics for 1963, it is hard to understand why this team didn't achieve more in the postseason. However, the 1963 Yankees' offense and the pitching of the 1963 Dodgers was just too much for the Twins. Killebrew's #375 1969 Topps card is one of the most important of his entire career. Killebrew would win the AL MVP Award after helping lead the Twins to the ALCS, which they would lose to the Baltimore Orioles in three games. Killebrew would lead the league in both home runs (49) and RBI (140). Although the Twins would lose the only World Series that they went to with Killebrew on the roster in 1965, he will always be remember for his great postseason performances. 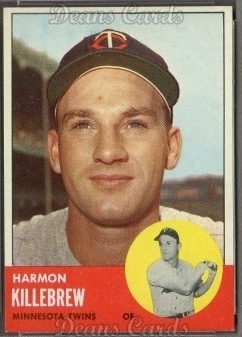 Please click here to view our entire inventory of Harmon Killebrew cards.